Real Madrid have told Thibaut Courtois' camp that they want to sign the Chelsea goalkeeper, and the message from Madrid is: "We're interested." The Spanish club have heard that Courtois, whose two children live in Madrid, is willing to make a move to the Bernabeu and Real have decided to change their two goalkeepers before next season. Chelsea have prepared a Plan A and Plan B for the 25-year-old, and Plan B sees the Premier League champions ready to hand Courtois a new contract that would make him the highest-paid goalkeeper in the world. His current deal, around £100,000-a-week, expires in 18 months' time, and in May the Belgian rejected an opening offer that did not meet his double-my-money demands. In recent weeks, his representatives have sat down with the Premier League club in an attempt to move closer to an agreement, but significant progress is yet to be made. 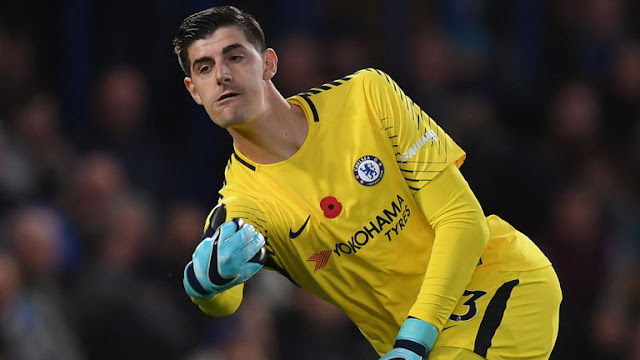 Chelsea are aware that talks over a new contract are complicated by the fact that Courtois' ex-girlfriend is now living in Madrid with their two children, and that the former Atletico goalkeeper has long harboured a desire to return to a city that he considers to be home. Courtois has registered 10 clean sheets in the Premier League this season, joint-highest alongside David de Gea and Man City's Ederson, while Tottenham's Hugo Lloris has seven. Courtois' save percentage (73.1 per cent) is higher than both Ederson (69.2) and Lloris (67.2), while Courtois has not made an error leading to a goal in the Premier League in the past two seasons, compared with De Gea (one), Ederson (one) and Lloris (five). And though Ederson's pass completion (87.4 per cent) towers above other Premier League goalkeepers, Courtois' rate (71.3) far outweighs former Real target De Gea's (55.3). If Courtois doesn't agree to extend his contract, Chelsea would look to complete talks over his transfer as soon as possible, even if the move were not to take place until the summer. As a replacement, Antonio Conte is an admirer of Sevilla's Sergio Rico and Atletico's Jan Oblak, among others names on the wish list. Real Madrid are seriously considering changing both of their main goalkeepers. Athletic Bilbao's Kepa Arrizabalaga has all but sealed a January switch to the Bernabeu, while Real's current No 1, Keylor Navas, has seen his form impacted by injuries and errors. Chelsea declined to comment on Courtois' future.